I love drinking tea outdoors, especially while camping. Listening to the conversation of birds, smelling all things earthy and green, the meditative experience is magnified in the fresh air. Early camping mornings are magical instead of hectic and blurry. The sun feel stronger and brighter, the colors of the world more vivid. But still, it's early. Without a clock the kids get up even earlier than usual. I Need tea for the caffeine just as much as for the reflective experience. Camping of course poses a few difficulties in preparing tea. How to heat the water? What to heat it in? What to steep the tea in? I'm sure avid campers are able to basically boil water with just a few sticks and some sort of vessel. But for me, I had to have just the right gear! 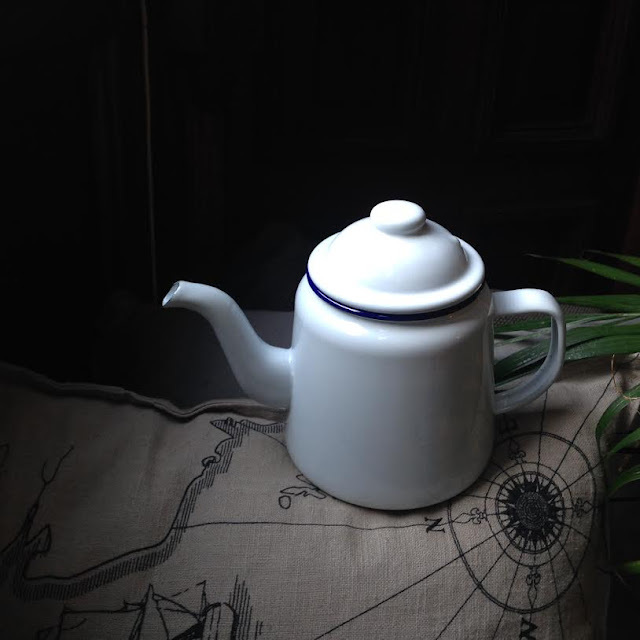 Only a sturdy enamelware kettle would do, with a few vintage cups for good measure. After looking for just the right kettle, I settled on a white version of this one from Falcon. Now that I had the perfect kettle and the right cups, I needed the right tea. One of my favorite aspects of camping is the campfire. The fire infuses everything around it with that iconic smoky aroma. I ended up bringing two teas with me on the trip, one is the delightfully smoky Wijnhuis Melange from de Pelikaan. This is a super strong black tea blend reminiscent of the campfire. It was perfect with with the bacony heavy breakfast we had to fuel a long day outside. 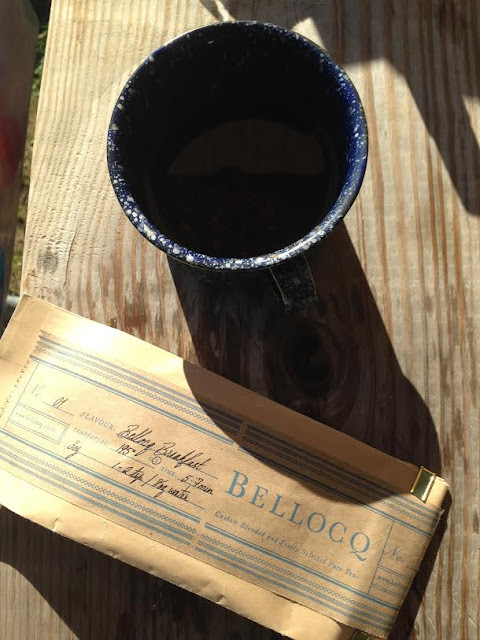 The other tea I chose to bring is the Bellocq Breakfast blend from Bellocq. I chose another black tea for the robust flavor and caffiene jolt. As much as I love a roasted oolong or subtle green tea outdoors, I wanted something comforting (black tea is very nostalgic for me), and uplifting. A tea that also has sturdy leaves I wasn't afraid of accidentally crushing during our journey. I also wanted a tea some of the coffee drinkers would try. This tea was exactly what I needed in the early morning with its bold, sweet flavor. It was perfect to warm up with a few cups in the chilly early hours while the kids ran around searching for sticks and acorns. The tea kettle was super helpful, and the enamel retained its heat for a nice long time. We boiled water in the kettle, and then I added a sachet filled with the tea leaves for steeping. If you are set on having the leaves completely loose, you may wish to bring some sort of strainer along. Since space is at a premium while camping, I chose the simple paper sachets instead of another gadget. Besides, I wanted to keep that extra room for the kettle! Perhaps it was 'glamping' with my enamelware kettle and mugs, but I'm just fine with that. I must have my priorities! Do you bring tea on your camping trips? How do you prepare it? My next camping trip is definitely going to include tea! i recently purchased a Contigo brand mug, that features an accessory strainer, that fits into the cup as part of the lid. you just fill it with loose leaf tea, screw it onto the cap and put the cap onto the mug of hot water and let it steep. i get a nice 20 oz of tea in a couple minutes. Hi Nikki, I have one of those too. It's great for tea on the go! Not right for our camping trip since I wanted more tea for a group, but great when it's just one or two people! i recently purchased a Contigo brand thermal insulated mug. I purchased an optional tea strainer accessory for it that screw onto the lid. When i go camping, this mug goes with me! I just fill the mug with hot water, fill the mesh strainer with tea, screw it onto the lid, then put the lid on the mug and steep.